The Wilshire Series two-sided check writing desk is our most popular design with its simple, efficient and contemporary look. Standard finishes come in red mahogany, cherry, golden oak, walnut, light oak, colonial, black, silver, gray, and gold, all with black top and clear acrylic writing surface. This check desk is also available as a Single-Sided unit (form holders only on one side).The two-sided unit has 12 literature pockets, 6 pockets on each side, (pockets are 4"wide x 9" deep). These well crafted desks are functional, attractive and economical. 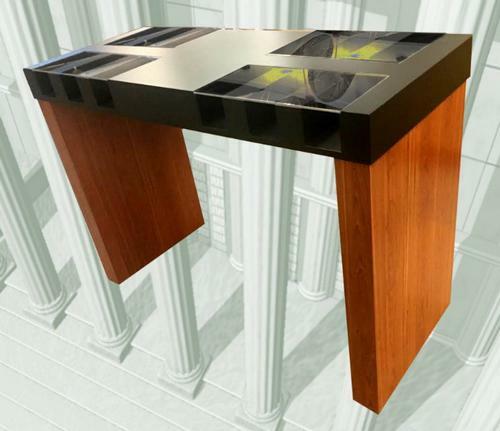 The desks have a sturdy laminate black counter top covered with a 3/16"-thick abrasion resistant acrylic surface. The check writing desks stand 41" high and have twelve built-in compartments for withdrawal and deposit slips, and six compartments for one-sided desks. (Counter top literature displays in some pictures are sold separately). The overall dimensions are: 58" W x 41" H x 24" D.
The Wilshire Series two-sided check writing desk is our most popular design with its simple, efficient and contemporary look. Standard finishes come in red mahogany, cherry, golden oak, walnut, light oak, colonial, black, silver, gray, or gold, all with a black top and clear acrylic writing surface. (Custom finishes are available on request.) Available in two versions: Double-Sided and Single-Sided.These well crafted desks are functional, attractive and economical.